Best Free Video Editing Software: After recording a footage on your phone or desktop or any other device, you may want to edit the video. Probably, you are looking for a free video editor available as you want to make your video look perfect before uploading it to Facebook or YouTube or forwarding it to someone else. If you are looking forward to doing just simple things like trimming a clip to resize or adding a voice over or combining several clips together, then free and user-friendly tools will help you in that case. And get the job done in no time. Else, you should go for a full video editing suite which will give you complete control for editing. 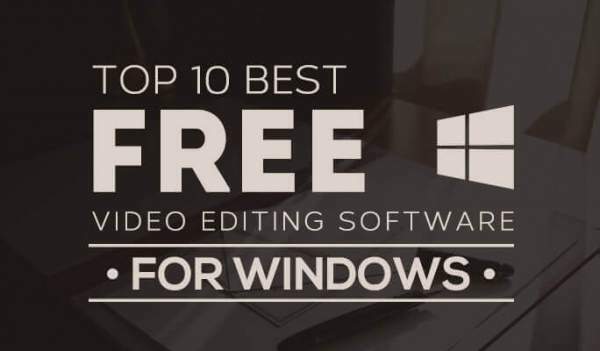 Here is our list of top 10 video editors available (both paid and free). This easy to use well known to everyone software was sure to get its place on our top 10 list. Earlier it used to come pre-packed with Windows OS itself, but from Win 8 onwards, these guys decided to do away with the trend and now it is available as any other separate system software. This is the perfect tool if you are not an expert in this field and want to try your hands on the videos of your son’s birthday party. To be precise, it’s a lightweight tool with a straight and simple user interface which makes it a choice of millions around the globe. It’s a full-featured free video editing tool for Windows OS. Beginners may find it difficult to use at the first time because it has an array of features and menus. But, you will get used to it after a while and won’t find as daunting as it was the first time. You can make use of the wizard to learn things around. It can be used to do a number of things like adding lines, text, shapes, charts, animations, images, audio, subtitles, among others. Also, VSDC can export videos in a number of file formats. It also includes an optional screen recorder and video capture program. The free version can be slow/laggy. Check: Watch TV Series Online. If you are a Ubuntu( or any other Linux ) user and are looking for the perfect tool to edit your videos, Pitvi is exactly where your search is gonna hit the end. You need not go anywhere after this. It is one of the best video editors. With tons of styles and transition effects to choose from and many more attractive features to go for, this one is surely the favorite of Linux lovers. Its effects and video filters are really mind blowing ones and are sure to hook you up the moment you start using it. Key Features: HD Support, NDE, Multi Track editing, unlimited video and audio tracks, and linear timecode display. Related: Free Screen Recording Software. If you are the proud owner of an Apple device, you are bound to come across this name-iMovie! This awesome video tool is the official release from Apple Inc. and stands true to every bit of the Brand’s brand value. The biggest advantage over other apps on the store is it’s easy to use drag and drag kind of interface, wherein you can simply put in any effect or transition and simply place it on the timeline. It has got many exciting options to choose from. And it turns out to be the Best Free Video Editing Software. And not to forget the fact that you would be able to edit your videos on your iPad or your iPhone also, with the same copy of the software. It has also got the option of iMovie Theatre that lets you watch movies from your Apple TV. This is another tool for our Linux users. This one is available for any of the Linux distributions and also comes in many languages. This software designed through C++ and has got a very simple and straight user interface which doesn’t present any problem for the first time users. It’s worth a try if you prefer using Linux based OS. See: Sites for Live Sports Streaming. This is one of the rare software which has its products for Linux, Window, and Macintosh. As the name itself suggests it is the best suited for very light weight video editing tasks. Also, professionals can also use this one without any worries. It is the best free video editing software. Even though it’s a paid software, it’s worth every penny you would be spending. You have got different modes to work with, depending upon the fact whether you are amateur or a professional. It has got a very simple interface which makes it easier for newbies to know the whereabouts of the tools. From simple animations to high definition slo-mo video captures, CyberLink PowerDirector has proven its worth in every possible arena. And not to forget its black colored design which makes it all the more appealing. Thus, it makes into the list of best free video editing software. Even though the price tag will make a very big hole in one’s pocket, I have not ever been face to face who say that it’s not worth it. This one can be considered as the Baap of the traditional, Sony Vegas Movie Studio. It is one of the best video editing software. This software has got the ability to produce a Macintosh supported content. And not to forget its long list of awesome features which contains Stereoscopic 3D editing, enhanced audio control, support for 4K video, multitrack audio environment, impressive media management, DVD Layout and Design along with one option to preview what you have done. Output Formats: MP4, WAV, WMV, MVC, MP3 etc. This one comes from the manufacturers of the well-known graphic tool CorelDraw. It is the best video editor. Powered by 64-bit power, Corel VideoStudio is everything an expert can hope for an amateur can handle through. One of its notable features is its ability to change playback speed as per the convenience of the user. This product from very well-known tech giant Adobe is surely worth a try. It is available for both Windows and Linux based platforms. It is the best video editing software. The advantage of having a product ready from Adobe is that Integration with After Effects and Photoshop becomes very handy. Key Features: HD Support, Multi Track editing, storyboard mode, unlimited audio and video tracks, linear timecode display, and NDE. This one surely needs no introduction and undoubtedly it was sure to be the top notch product to opt for. AVS Video Editor, developed by Online Media Technologies has got a lot to offer to you whether you are an expert photographer or simply any XYZ with almost no experience. Integration with social media handles like facebook and twitter make it even more interesting as one can directly share his or creations on his timeline. Input Formats: AVI, MP4, MKV, FLV, AMV, 3GP, MPG, DAT, VCD etc. Price: All software from AVS is available as a bundle for $59, but you have an unlimited trial version. Key Features: HD Support, Nondestructive Editing, Single Video Track, Dual Audio track. Hope you got to know the best video editing software. Do you know any other software which should be in the above list of best video editors? Let’s know. Stay tuned to TheReporterTimes for more tech updates. Next articleHow To Fix 403 Forbidden Error (You Don’t Have Permission To Access / On This Server): What Is It and Its Solutions?